Just kidding. Still plugging away at that pesky pocket journal. Doodling borders and frames. Deleting prompts that aren't quite right and dreaming up better ones. Printing off sample pages. So close! "Wisdom depends on experience." So says Barry Schwartz in his TED interview on NPR and he's right, of course. Which is why I think first-time parenthood (or living with your partner for the first time or owning/renting your first home) is such a visceral shock. You wander around at times (and by you, I mean me) muttering, "why didn't anyone tell me?" They probably did. You can read a million books on the subject (still me), but until you've lived it -- tasted it, smelled it, touched it, worn it -- you just don't know. I'm still at the stage, with my little business, where many of the decisions I make are firsts -- the experience before the wisdom. Sure, I read a lot and I ask a lot of questions of family, friends, and professionals who've been down this road before. In the end, though, I have to take a deep breath and make the decision, not only the right or best decision in the circumstances, but the wise decision. Which means risking, at times, making the wrong decision. Making a fine mess out of things. In the pursuit of wisdom. It's the only way. I almost didn't post this doodle. I've been working on my lettering, along with trying to figure out the blending characteristics of my paints. Not quite there yet, but the work continues. I think your lettering is beautiful!!!! Love it! Ok sister girl ... 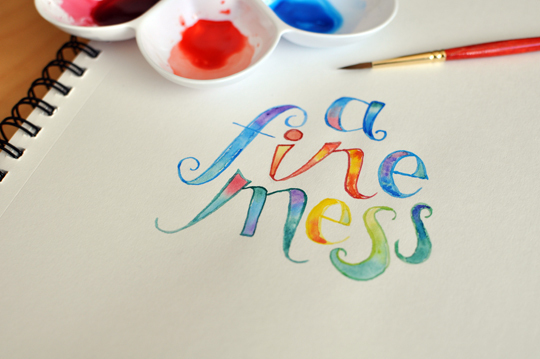 I say "a hot mess" all of the time .. so this little doodle COMPLETELY hit me. I LOVE it!